The Orionids meteor shower, also known as debris from Halley's Comet, will be visible Thursday night with up to 20 shooting stars per hour. It’s going to be quite the show Thursday night, as NASA is project up to 20 “shooting stars” streaking across the sky each hour. These are the Orionids, which are debris from the famous Halley’s Comet that visits every 75 years, last stopping by in 1986 and returning in 2061. The comet leaves debris behind as it passes through our general area, and these debris hang around in space, waiting to collide with Earth’s atmosphere on a regular basis – about this time each year, in fact. Unfortunately, it won’t be an entirely unobstructed view. There will be a waning gibbous moon in the early morning hours, and then the sunrise will make it tough to see the Orionids. The meteors will fall mostly after midnight, and they get to their most intense in the hours just before the day breaks. They are likely to peak in the early morning hours of Friday, Oct. 21. The best time to catch a glimpse of the action will probably be sometime between midnight and dawn, when it’s dark enough to see them. 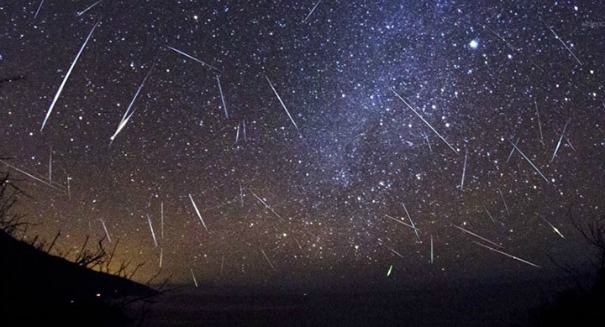 If you’d rather stay indoors, or just want a better view, you can view a live stream of the meteor shower on the Slooh Observatory’s website beginning at 8 p.m. eastern time Thursday night. To view it outside, you need to be away from as much artificial light as possible. That means people in the cities will probably have a hard time seeing it with all the light pollution. If you can, head to the suburbs or into rural areas.